As healthcare organizations strive to build meaningful relationships with referring physicians and serve as a trusted provider when a referral need arises, there is often a lack of clear understanding of referring physician decision making factors. Although some commonalities exist (such as weighing overall quality, convenience, and available treatment options), this general information does not provide enough insight to prioritize strategic planning and outreach efforts in a unique market and with a particular service line. Gelb has been on the forefront of marketing research for decades, and our Decision Factors Analysis approach has been used by leading healthcare providers to help them solve the challenge of referring physician decision making. 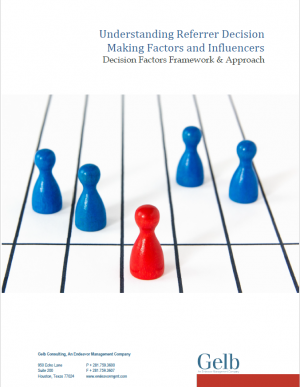 In this white paper, we provide an overview of how to complete Decision Factors research in order to understand what matters to most to referring physicians when making a referral decision and to enable better allocation of physician outreach and marketing communications resources.